It didn’t work out, but boy-oh-boy, what a way for the Aggies to go down swinging Thursday against fifth-seeded Auburn in the NCAA Tournament. It’s hard to call the 12th-seeded Aggies losers after their showing in the opening round of the Midwest Region, though. 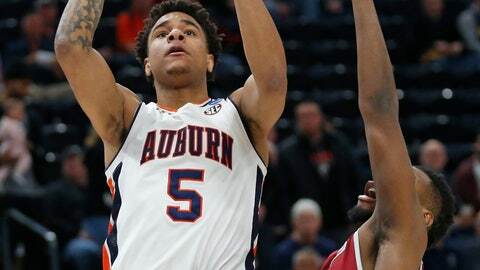 Harris said he knew the Aggies were trailing by two as he took the inbounds pass with 6 seconds left, darted up the left side of the court, sped past J’Von McCormick, and then got a step on Auburn forward Chuma Okeke. With McCormick making the choke sign as Brown toed the line — “I saw in his face, he was pretty scared,” McCormick said — the junior guard watched his first free throw clank out. He stepped up again and made the second. Then the third one bounced around the iron before bounding out. That huge sigh of relief? It came from Auburn. The Tigers (27-9) led by as many as 13 midway through the second half, and McCormick’s three-point play gave Auburn a 73-65 lead with 2:13 left. Two turnovers, two missed free throws and two Aggies 3-pointers later, the Tigers were fighting for their lives, hoping Brown, a 78-percent free-throw shooter who had more attempts from the line than anyone on his team this season, would miss at least one. “Until you get in that moment, you don’t know how you’re going to react,” Auburn coach Bruce Pearl said, when asked about the Tigers’ near meltdown. The Tigers will play No. 4 Kansas, an 87-53 winner over Northeastern.